The Chicago Regional Council of Carpenters and the Professional Flooring Installers Association (PFIA) joined forces with other area donors to help the DuPage Children’s Museum recover from a devastating flood. After the flood in 2015 the Museum was forced to close for renovations. Six months after the Museum’s grand opening as a re-imagined space it is now surprising and delighting everyone who walks through the doors. All areas of the Museum underwent reconstruction except for the administrative areas that are located on the second floor. “Our main focus after the flood was to re-imagine the public spaces of the Museum and create a beautiful, innovative and interactive experience for our visitors,” explained Director of Exhibits & Operations Kimberly Stull of the DuPage Children’s Museum. “In order to reopen as quickly as possible and due to financial constraints the decision was made to leave the staff area as is. 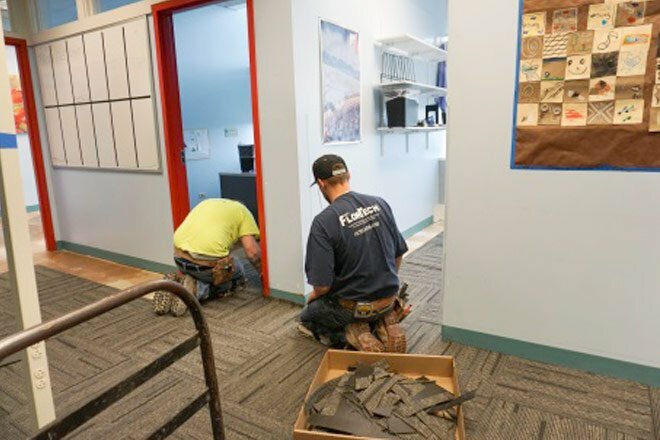 New carpeting was needed, and the Carpenters Union and the Professional Flooring Installers Association (PFIA) joined forces to see support the nonprofit. President Tom Sheridan of PCI Flor Tech, an Install certified contractor was instrumental in securing donated carpet from Mohawk. The Museum been positively impacted, and thanks to the CRCC and PFIA, the Museum was able to give back to local community organizations. The Chicago Regional Council of Carpenters represents more than 30,000 men and women working throughout 81 counties in Northern and Central Illinois and a portion of Eastern Iowa. Members of the Chicago Regional Council of Carpenters include carpenters with these specialties: General Carpenter, Residential Carpenter, Exhibit and Display Installer, Interior Systems Carpenter, Lather, Cabinetmaker and Millworker, Flooring Installer, Pile Driver, Millwright, Insulation Installer, Roofer, Siding Installer and Certified Energy Analyst.